An cable bridge near Montezuma Falls. Is it just me or does this rock formation look like a seal hugging a whale?! An old disused bridge of the way to Montezuma Falls. Happy hikers on the Tarkine's wild west coast. Many of the Tarkine's walks are well signposted. The Tarkine is a photographer's paradise. Rockhopping on Corinna's wild west coast. Corinna's restaurant serves tasty meals. One of Corinna's charming homes that have been renovated. Tarkine's trees are very photogenic. Nighttime on the Pieman River. The holiday town of Corinna is charming. The Tarkine has well made trails. The steps to Philosopher Falls. If you don't know much about the Tarkine don't be upset. 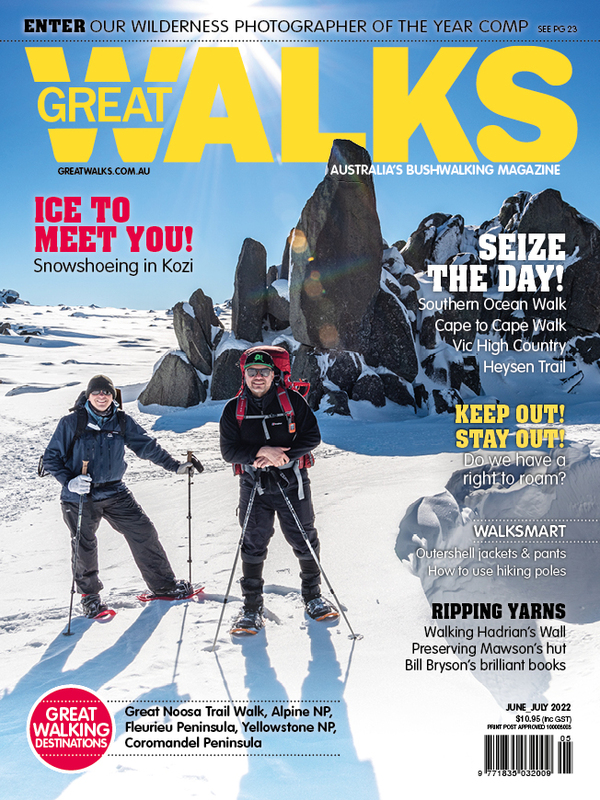 The area has been overshadowed by more popular walking destinations such as Cradle Mountain and the Tasman Peninsula, home of the Three Capes Track. However, the Tarkine is one of Tasmania’s hidden treasures with 477,000 hectares of untouched forest thick with tree ferns, giant man ferns, Huon pine and spectacular rivers and streams. The region is home to unique habitats which support a myriad of wildlife including burrowing crayfish, platypus and stunning birds. Great Walks explored the reagion with Park Trek walking tours. For the first three days we were based in the old mining town of Corinna, which features gorgeous worker's cottages that have been renovated. Each cottage includes hot showers, kitchens, loungeroom, comfy beds and lovely porches. There's also a restaurant and bar providing excellent meals. Using Corinna as a base allowed us to do some lovely days walks like the hike up Mount Donaldson on day two, just a few kays away. From the carpark we walked through some lovely forest and then out onto the open button grass ridge all the way to the summit. It was a grandstand view of the Pieman River, the rainforest valleys of the Donaldson River, the Tarkine’s deep interior, and the Southern Ocean to the west. The return took around 3-4hr. The following day we headed to the Tarkine's wild west coast onboard a lovely ferry that cruised along the Pieman River. The highlight of this day was rockhopping on the amazing granite tors soaked in fluorescent orange lichen. I've seen rocks like this on the Bay of Fires and Victoria's Wilsons Prom but this was the best collection of granite rocks I had seen anywhere. After Corinna we headed to the lovely village of Zeehan and its award-winning museum – which is pretty much half the town! I could have spent a full day here exploring the old buildings and learning about the area's colonial and mining history. This is also a great place for kids as it's pretty interactive. From Zeehan we drove to Tulla and its glorious lake. The whole week was unseasonably hot and I fitted in about half a dozen swims in lakes, rivers and even in the Southern Ocean. Park Trek's guides were professional, friendly and very informative – and they also prepared some very tasty meals. The five-day Tarkine experience allows you to explore one of Tasmania's lesser-known areas full of natural beauty, stunning vistas, compelling history and, of course, great walks.